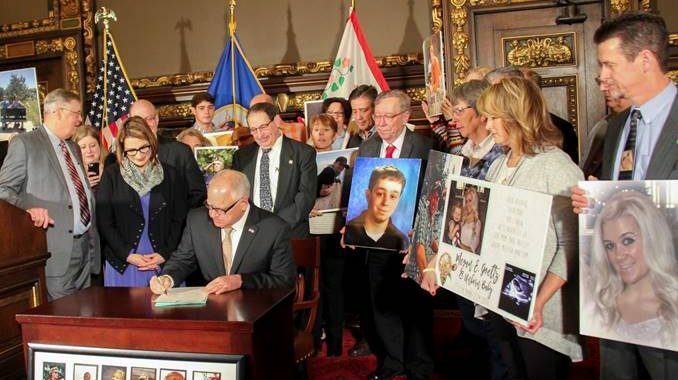 [ST. PAUL, MN] – Governor Tim Walz today signed Chapter 11, H.F. 50, into law. The bipartisan ‘hands-free’ bill that bans the use of hand-held cell phones while driving aims to prevent distracted driving accidents. The bill requires drivers to be ‘hands-free’, but allows use of voice-activated commands in a ‘hands-free mode’ for calls and other functions like GPS navigation and music applications. The law does not apply to drivers outside of traffic or in emergency situations, and expands on current Minnesota statutes that ban texting, using email, and browsing social media while driving. Minnesota joins 16 other states and Washington, D.C. in banning handheld cell phone use while driving, with the law becoming effective August 1, 2019.